Yacht Broker Chris Caroll : Atlantic Yacht & Ship, Inc.
Hi Chris, We just want to thank you, for working with us. We appreciate all the assistance and input during the sale as well as the completion of the work. You demonstrate a true passion for not only your boat but for your position at Atlantic Yacht! We love our new boat and hope to create many family memories as we motor around the waterways. Chris Carroll is Mack II’s younger son. Chris was born and raised in Myrtle Beach, SC. At the age of ten, he started his own business when he convinced his dad to buy him a used riding lawnmower to cut lawns for profit. His entrepreneurial approach at a young age molded him into the success he is today. For years, Chris was the Roman rider at Dolly Partons Dixie Stampede Dinner Show. More recently, Chris has developed an equestrian development outside of Myrtle Beach, where he has built custom homes from 2,500 to 7,500 sq feet. 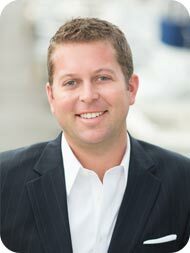 Chris is a licensed yacht broker in the state of Florida and California, he obtained his SC Commercial and Residential Builders license, and is a licensed real estate broker in the state of South Carolina. Chris is working the Florida and California offices of Atlantic Yacht and Ship. Growing up in and around the coastal waters of South Carolina is what made Chris’ love of boating a perfect fit for this Industry. Chris is willing to go the extra mile to insure that you he fits each and every client with the perfect vessel of their dreams!